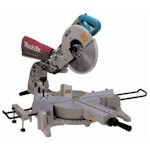 Miter Saws are used to make accurate angle cuts through long pieces of material. For jobs like adding molding in a room or building drawers, boxes or cabinet they are an essential piece of equipment. Shown above(left to right), a Makita 12in double bevel miter saw, a Dewalt 8 1/2in sliding single bevel miter saw, a Delta 12in single bevel miter saw with dual lasers. Note: technically a miter saw is any saw capable of making a miter cut (i.e. a 45% angle). Some people will refer to table saws as miter saws. 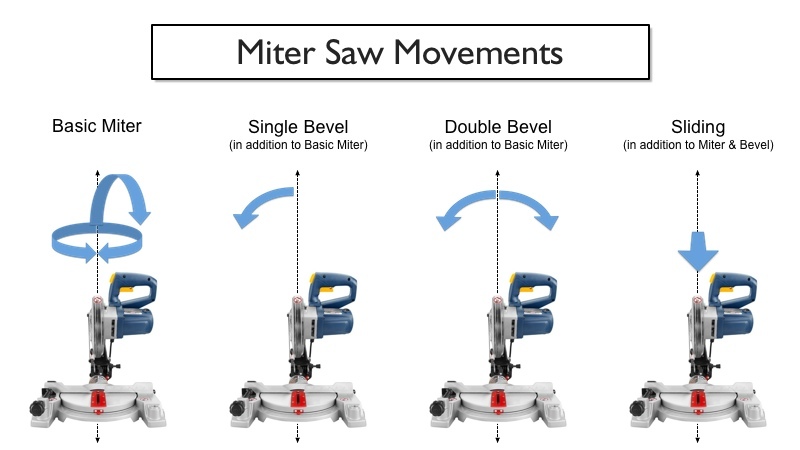 For the purpose of this article we are using the more common definition of a miter saw being a saw mounted on a swinging arm. Single Bevel - the swing on the horizontal axis ranges from 0 degrees to around 50 degrees. Double Bevel - the swing on the horizontal axis ranges from around -50 degrees to +50 degrees. Single Bevel saws can make the same cuts as double bevel saws by rotating the work material, it is a matter of convenience. You can tell type the type of compound miter saw by looking at the shape of the fences. 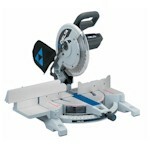 Sliding Compound Miter Saw - a compound miter saw that slides in and out from the base. This range of motion allow for cutting wider pieces of materials. Sizes - The most common sizes are 8 1/2in, 10in, and 12in (size refers to the blade diameter). Although larger sizes exist too. Larger sizes can make larger cuts, smaller sizes make more accurate cuts on smaller pieces. Bevel Stops (Positive Stops) - factory set grooves that make it easy to adjust the saw to common angles (e.g. 45 degrees, 30 degrees, etc.) Saws should have an override that allows the operator to ignore the stops. Scales - the markings which show the angle of the saw. The ease of getting accurate angle setups vary across saws. Some scales must be used by looking at the markings from a specific angle. Blade Guards - all miter saws sold in the US have self-retracting blade guards to protect the operator from injury. Electric Brakes - systems to stop the saw blade quickly once the trigger is released. The idea is that this can help prevent operator injury. Dust Collection Systems - most saws have either a dust collection bag or a port for connecting to a shopvac. Table Extensions - pieces that attach to the side of the table for cutting large pieces of material. Usually third-party supports work better. Fences - the backstop which the materials are held against for cutting. Compare the surface quality and the ability to easily adjust its position. Laser - some saws have a laser guide to show where the cut will start. Some saws have dual laser systems which show the beginning and end of the cut. Warranties - typically range from 1 to 3 years. Power Source - corded versus cordless. While cordless saws are available, they are only appropriate for very specific situations (e.g. where access to power is unavailable or use is very light). Determine the size and power of saw you will need. Choose the smallest size that will handle all of your jobs. The smaller the saw the easier it is to maneuver. 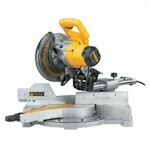 If you are uncertain, a 15 amp, 7 1/4 inch saw will handle almost all general cutting needs. Cutting capacity is usually quoted in terms of the maximum height and width of board that can be cut with a 45 and 90 degree miter (rotating around the vertical axis) as well as the maximum cut for a 45 degree bevel (around the horizontal axis) and a compound 45 (around the vertical and horizontal axis). Choose a model that has easy to adjust depth and bevel angles. If possible get a sense for the comfort of the saws handles.